In April we ran across a rapper in Miami by the name of T-Ro. His story captured our attention and apparently yours, too. Our #1 most popular page on Coyote Music's website during April was our article, "Miami-based Rapper T-Ro Inspired by Birth, Death, and a Missed Shot at the NFL." If you haven't yet read about T-Ro, check it out. The mysterious popularity of the defunct band Altitudes out of Round Rock, Texas, continues. This month they are #2. We talked to them and added links on their Artist Page that point to their newest project. Maybe their new band, that actually performs, will be as popular as their former iteration. Coming in at #3 was a benefit we promoted at The Longbranch Inn, in Austin. The benefit was aimed at raising medical care funds for El Pathos frontman David Duet, who underwent multiple surgeries on his hand after an accident during South By Southwest. David made a surprise appearance that night at the show, coming straight from the hospital and still wearing his hospital gown. Best wishes to David for a continued and complete recovery! 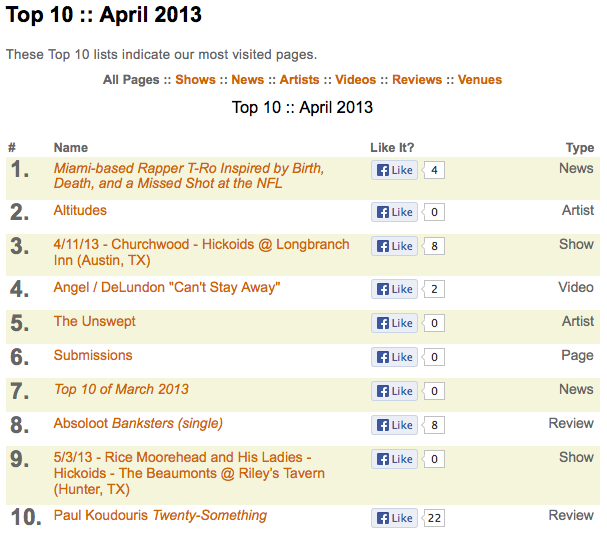 The video for Chicago Hip-hop duo Angel / DeLundon's "Can't Stay Away" was our 4th most popular page. Also from Chicago, The Unswept came in at #5. 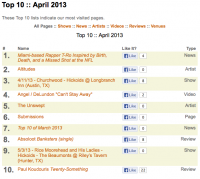 As business remains busy for Coyote Music, our Submissions page was #6 and our re-cap of March's Top 10 garnered the #7 spot. We reviewed the single "Banksters" for Florida rapper Absoloot, and that has continued to draw web surfers, becoming April's #8 most-visited page on our site. This Friday night, May 3, our #9 goes down! Riley's Tavern in Hunter, Texas hosts Rice Moorehead and His Ladies, The Hickoids, and The Beaumonts. This will be a night to remember for the fine folks in Hunter, located between San Marcos and New Braunfels in the Texas Hill Country. We're pretty sure Riley's has no idea what's about to hit them. Rounding out our Top 10 of April 2013 is our review of Paul Koudouris' Twenty-Something. Nice album, Paul. Thanks for sending it our way. Please join us again, same bat time, same bat channel, for next month's scintillating monthly Top 10. And if you didn't see someone or something you like here, please, go to that page and Share, Tweet, and +1 it!